Where have I been? Sick as a flipping dawg! Went to London for a meeting and came back with what I thought was a sore throat. A few days in and I had lost my voice (which I thought was funny) and by the end of the week I could no longer breathe properly and had to call on a neighbour for help who took me down to the local hospital. This was the sickest I have ever been in my life and it has taken a long time to push past it. I’ve broken bones before, but this was something else. Regrettably it meant I had to pull out of the Holmfirth Art Market. This had been in my diary for most of the year, and it was a big event for me and I was very upset about it, but there was no way I could have managed and I was worried about spreading my infection further. The organisers were very understanding and I am very grateful for that. All together I lost nearly a month’s worth of working time and have had my head down since, trying to make up for lost time. But progress has been made on the Long Night project discussed last time. I warped up the main treadle loom in the workroom pretty much trouble-free even though it was the biggest warp I’ve put on it, around 570 warps, all six yards wrong. I threaded the warp onto the bar of the warp beam rather than tie it the warps on and although it meant shifting the loom a bit, it has made for a much neater start. I have always had a snagging worry that although I love textured surfaces, I was hiding behind them a little and wanted to tone it down a bit for this piece. 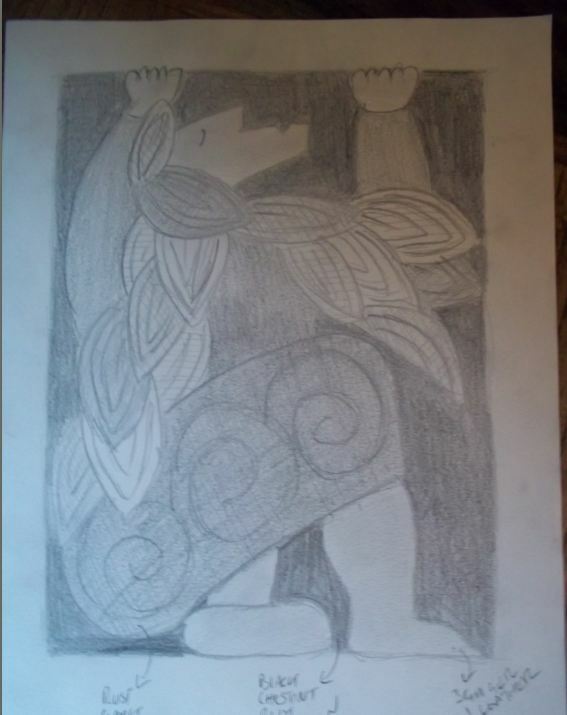 I wove the hair of the first figure as simple waves. That was how I wanted it, plain, simple, calm and with just a line of soumak to separate them. But once it was done, it was pretty lifeless and I didn’t like the colours. They worked together in the samples, but didn’t seem to work on the larger scale. When I start doubting myself and start messing about on the loom, throwing out all the planning and preparation is where I generally start to go wrong so I was determined to see it through. I got about two-thirds through when I accepted it was wrong and it had to come out. It took all day to unpick as I wanted to preserve the wool rather than just rip it out. It has taken a long time to find an alternative. 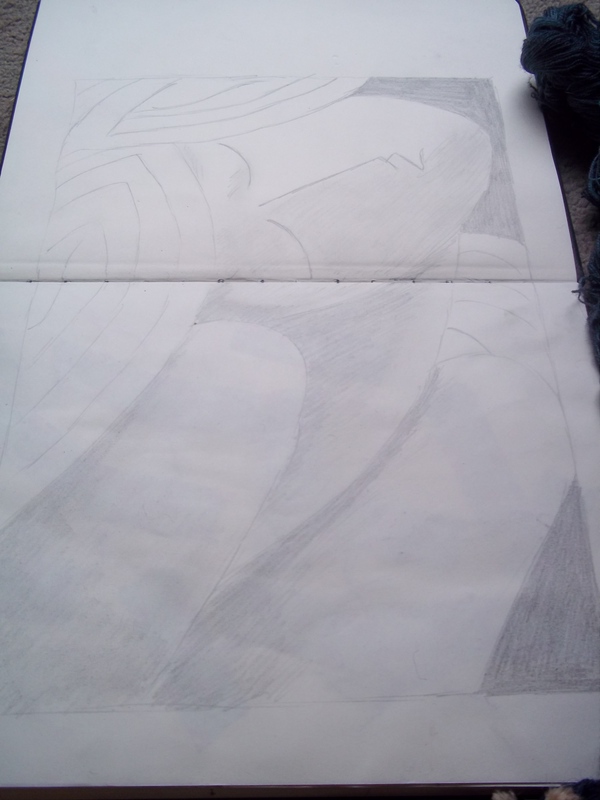 I still wanted waves that followed down the length of the figure’s back, but it also had to have some life to it, but also be relatively simple. This is only a small part of the tapestry and I didn’t want it to be too overwhelming. The result is shorter waves and curls within the larger waves. It looks to me like fields or waves or even flames and the latter seems particularly relevant as the project is to me about survival and rebirth. The colours I kept the same and they seem to work much better now. My inspiration for the colours have come from Anglo-Saxon ship burial at Sutton Hoo which hopefully will become more obvious as the tapestry progresses. I feel that the cell-like structure of the new hair echoes something of the cloissonne technique used in the jewellery. In my head it does, anyway. Having to unpick as much as I did meant I could weigh the wool I’d used and get some proper calculations as to how much yarn I was using to cover an area so I’ve been able to make some good estimates on how much I need to dye for the rest of the project, which will be my next job. It is a lot less than I thought. I am going to try very hard to only dye what I need, and not do a few more 100 grams just in case the laws of physics should change when I am not looking. I’ve changed the way I’ve been winding my wool. I used to wind the wool from dyed hanks into a ball. It was a massive, rather unpleasant job, and they usually just got tangled on the spool rack anyway when trying to wind up the bobbins. I have instead started to use my mum’s old cake beater as an electric winder, putting the wool directly onto tubes (sitting on a drinking straw) which is much quicker. I then stand whatever tubes I am using to wind the bobbins on an upturned raddle. I am using more colours than I have done previously, and it seems a lot easier to just pick out tubes from labelled tubs than have them all fight over space on one of the spool racks. Looking over my last few posts I realise I haven’t shared some of the samples I’ve been working on for the DMV projects. Initially I was going to try working with fewer warps per inch than I am used to, but I wasn’t happy with the result. I was cutting corners for the sake of time. The new samples are a much more literal rendering of the original designs, and hark back to The Hanging Tree project, but I do rather like them, they are something very different and I will be warping up the smaller treadle loom in the next few days to get on with these. I had a lovely afternoon in Leeds visiting the British Art Show. I have to confess a lot of it was over my head. But I did very much like Jessica Warboys Sea Paintings, the one on show being made at Spurn Point. She scatters pigments onto canvas and lets the waves of the sea distribute the colours. I only had my phone with me, so forgive the quality of the photographs, but I did want to share something of the scale of her work. 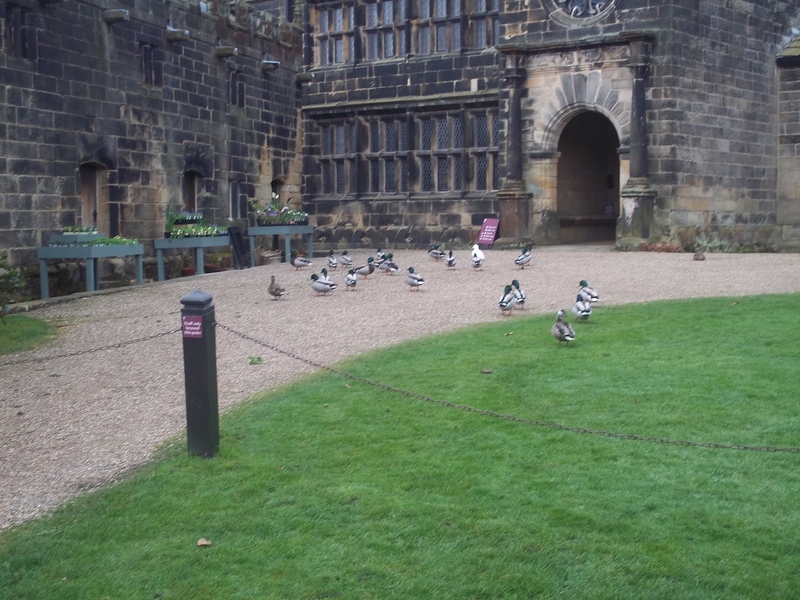 BAS8 is on until the 10th of January before it moves on and is certainly worth a visit. Sorry to be so cryptic for now, but in amongst all the nightmare of the last month or so, something rather wonderful has happened, which may or may not mean that my movements next year may be a little unsettled. For this reason I have delayed announcing the dates of my workshops until February. For that I sincerely apologise but I didn’t want to go ahead and then have to change them, wasting everyone’s time. And if you wouldn’t mind praying to the loom gods on my behalf, I would be very grateful. My blog has been quiet for a few weeks, for which I apologise, but I have been massively busy. I took some time out to deal with the domestic aftermath caused by the new loom that arrived earlier this year. 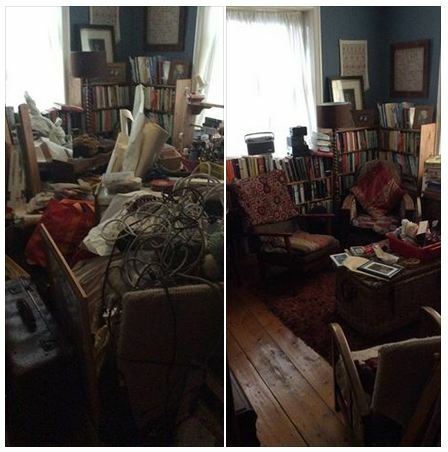 It was the first time this year I have had breathing space long enough to tackle it and that I can now get in some rooms which before I couldn’t even enter has proved a great relief to my sanity (before and after shots of my study below – don’t judge me!). It was hard to undertake such a major destashing but I feel all the better for it, and not least because a lot of stuff was collected by Scrap Magic a local initiative in Bradford that provides craft resources for children’s activities. I’ve been busy writing applications for various projects and I’ve also been hard at work on the first DMV project and will be warping up the loom this week to start the tapestry proper. I spent a good deal of time making samples, wanting to create a surface with some vigour, something to reflect ridge and furrow and earthworks. It took longer than it should have to realise the answer was staring me in the face, by adjusting my sett and making a coarser weave I got just the texture I wanted. I’m looking forward to seeing how this works out on a large scale piece. Yesterday I went to London for a committee meeting with the Heritage Crafts Association. I had just enough time to nip into the British Museum. I was almost scuppered by the most horrendous queue due to bag checks but kindly one of the guards told me about the entrance round the back and I got in in no time. I was heading for the Coptic tapestries, the Copts being Christians in Roman Egypt from the 4th century AD onwards. They are famous for their textiles which have mostly come from burials and have survived due to the dry conditions. The photographs were taken through glass with an ipad so I know you will forgive me for their quality. I was surprised, seeing them in the flesh, how finely woven they were – as a guide the medallions are roughly a handspan in width. And how vibrant are they? Take a moment to remember someone spun and dyed these yarns around 1500 years ago (and yes, those are my legs int he reflection above, I have very shapely pins). Many of the examples on display like the first two above were appliquéd onto linen tunics. 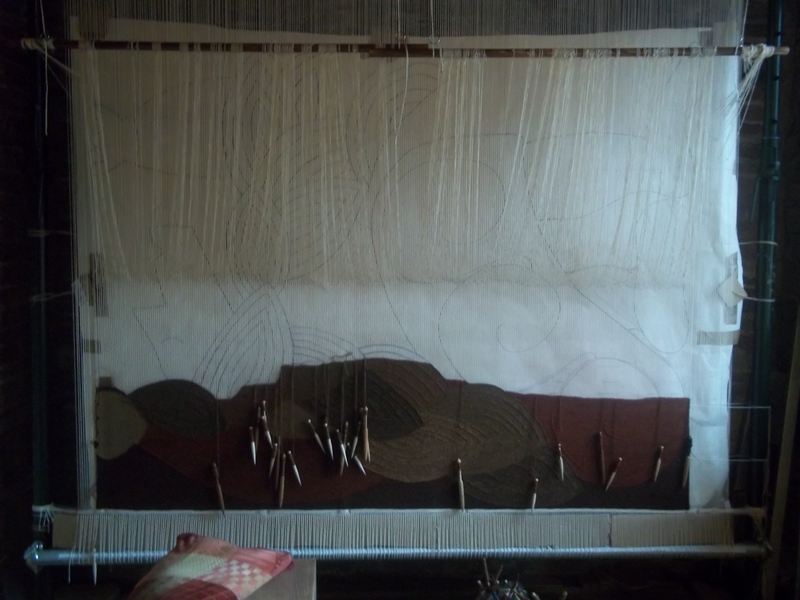 But in another example the linen warp used for the tapestry was doubled up. It was then split, doubling the sett, and used to form the tabby ground. The tapestry was integral to the cloth. The weft incidently, is wool. The use of soumak was heavily evident, outlining various elements in the border and main figures. The tapestries were behind glass, but it did mean one could get very close (except those near the floor and which would have involved getting down on one’s hands and knees (!!!)) and the area was well lit so it was fabulous to see these tapestries in the flesh. If I am totally honest they aren’t really my cup of tea aesthetically, but they are growing on me, and it is impossible not to marvel at the stagering technical expertise behind them, or their vibrancy, or their survival. If you ever get a chance to see them , I whole-heartedly recommend them. Weeks 15 & 16: Calamity!!! 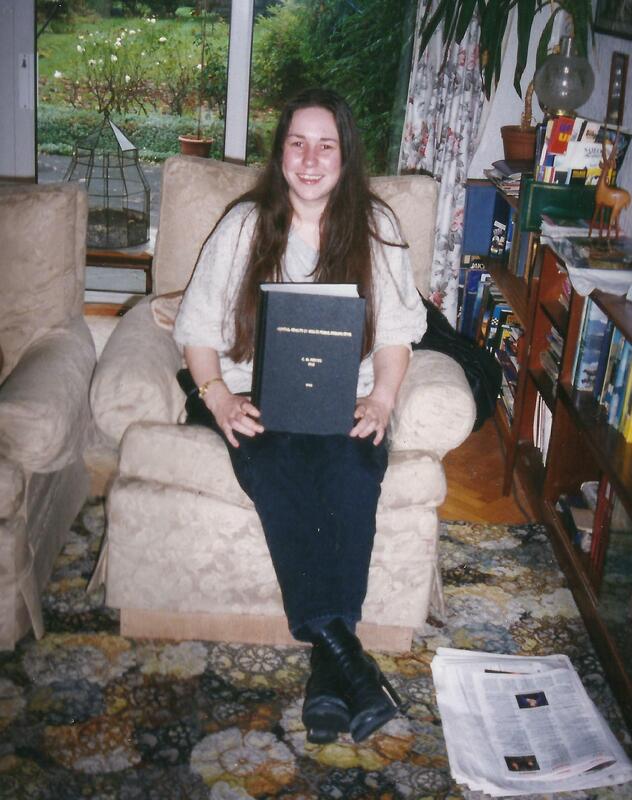 Just a short catch-up post from me today. I am very, very hungover but with good cause. All the wool I use is hand-dyed, so I am very careful about mixing my batches when I weave so any slight colour differences can be smoothed out. I thought this was less of an issue with the hair of the figure in Found Drowned because it was such a jumble, and the colours I was using were staples of my palette so I knew they were very reproducible. So I didn’t think anything of it when I ran out of my light rust colour and toddled off to my dye lab (aka my kitchen) to make some more. I wove with it and it was wrong, wrong, wrong. Too light, too yellow and it was really obvious on the tapestry. I could not for the life of me figure out why it was wrong – it matched all my wraps and swatches and even seemed to match earlier sections of the tapestry. I cut off a tail from the back of the tapestry and saw one of the original rusts was slightly pinker and that threw the whole thing off when blended. I was pretty devastated and it did cross my mind I would have to abandon the whole thing. I even started going through some of my earlier tapestries to see if it had any of that elusive colour I could pull out. 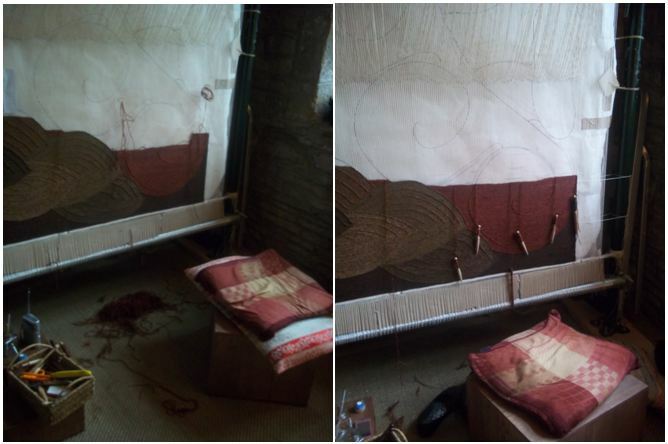 The only other option was to pull out all the hair and redo all that work, but no way would the tapestry to be ready in time. I went to bed feeling pretty miserable and very, very tired. I haven’t had a break for a long time so I wondered if a couple of days off would help me figure out the solution. But instead I woke the next morning determined to try to recreate that pinkish-rust colour. I’m grateful to the scientist in me for meticulous record keeping in my dye book, but it still took over a dozen attempts to redo it, but I got there. It’s not the an exact replica, but it doesn’t show as different when blended. I’m grateful that I had plenty of wool to do all these experiments guilt-free, but it was a very frustrating experience, changing slight elements of the formula each time to try to recreate whatever it was I did last time; many were too brown, or too orange, but no doubt I will be able to put them to use in a later project. So I deserved a drink last night, and fortunately I had been invited along to the Beer Club at the Saltaire Brewery by chums from East Riddlesden Hall. There is nothing like Plum Porter, hog roast, good company and a dusky grey sky streaked with flamingo pink to cure the soul. I went to bed thinking I would work today, but I am too hungover to trust myself at the loom and it is probably not a bad thing to have a break from it for a day. Phew. Phew. Phew. And Phew again. 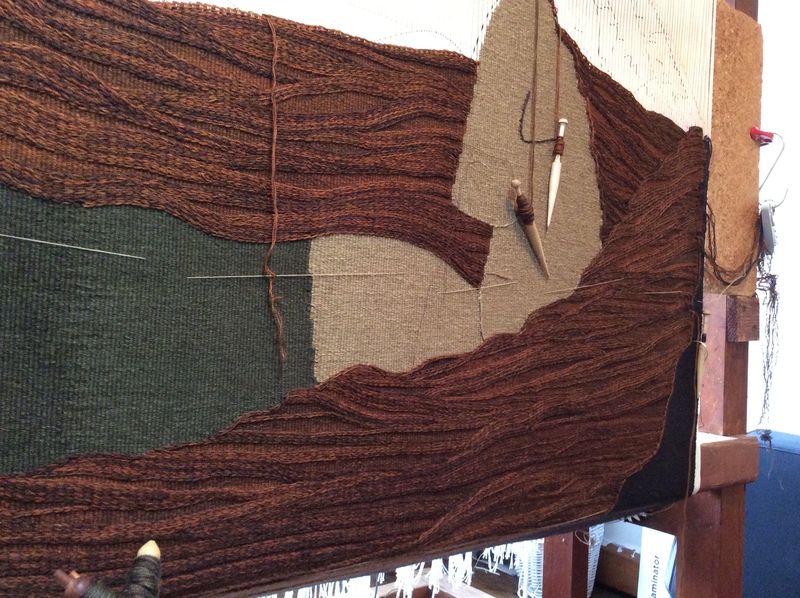 Happy to report progress has been made on the new tapestry, so that’s a great big HUZZAH to me, please! 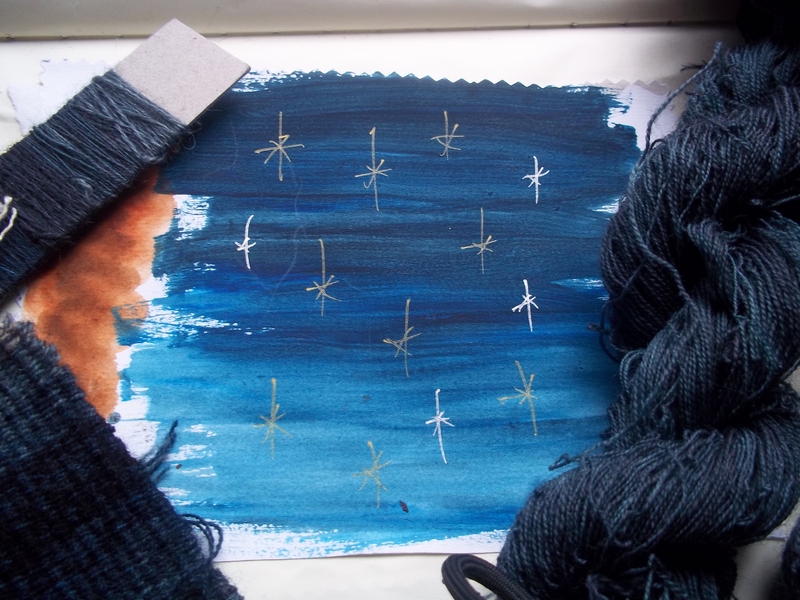 Some of my dyeing didn’t turn out as expected and in a good way – the browns were redder and the rusts darker and I wanted to make the most of them and play with the contrasts of the rich blues that will be at the top of the tapestry with rust, chestnut and bronze blends below. So I decided to ditch all the samples I did beforehand and am instead making them up at the loom; it has resulted in quite a lot of unpicking but I have settled on the new colours and I’m really pleased with them. It has been really hard to get a decent pic with the light being so bad but I am on it, I promise! I did have problems ‘connecting’ with the tapestry, rather strange considering it is so autobiographical, but there was something missing. 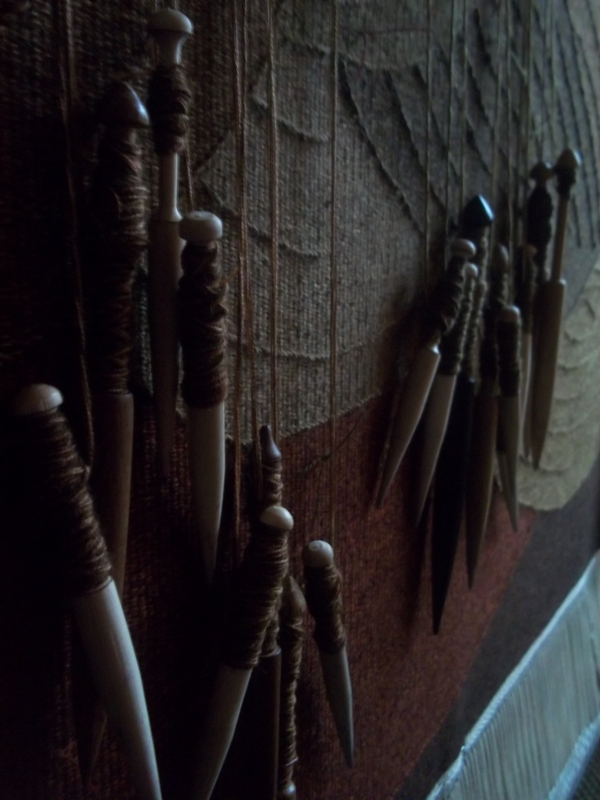 I wondered if it was my work environment, perhaps I was focusing on the mess and disorganisation rather than the weaving. I took a couple of days to overhaul the workroom, but still things weren’t right. Whilst working on Maides Coign at East Riddlesden I was literally surrounded on all sides and in every eye line by what had inspired the tapestry, it was easy to be immersed, and eventually I realised it was that immersion that was lacking. I kept a notebook during the development of the project and although it is creaking at the spine it is an invaluable reference as I weave. Some technical notes though float around near to where I am working. 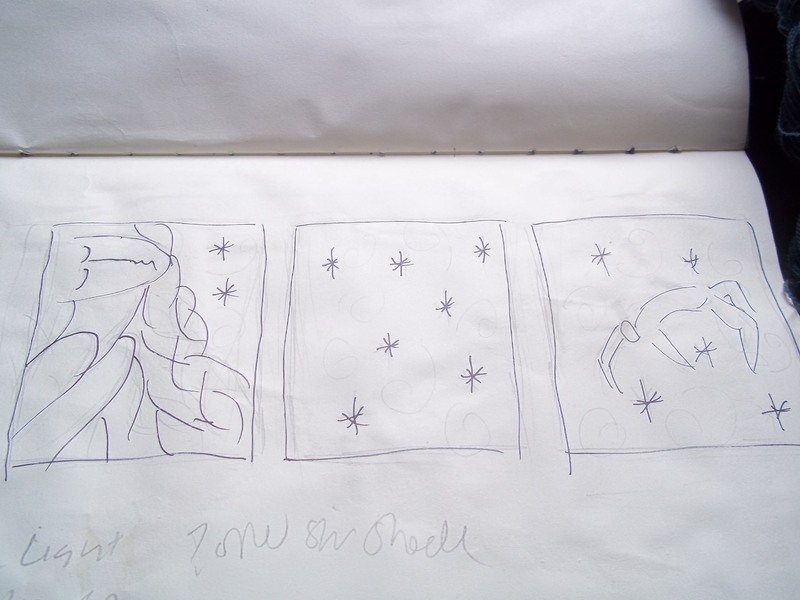 One evening I suddenly found myself pulling out a piece of chipboard and sticking those notes onto it and I was soon delving into my notebook for some of the woven samples, as well as some of the sketches and the inspirations behind the tapestry. I was quite surprised when I put everything together like this, to see I had pretty much replicated the colour palette of the Apocalypse tapestries. I suppose it shouldn’t be a shock considering how much I’d been thinking about them recently and writing about them in a recent post, I just didn’t realise how much they had taken root in my subconscious. 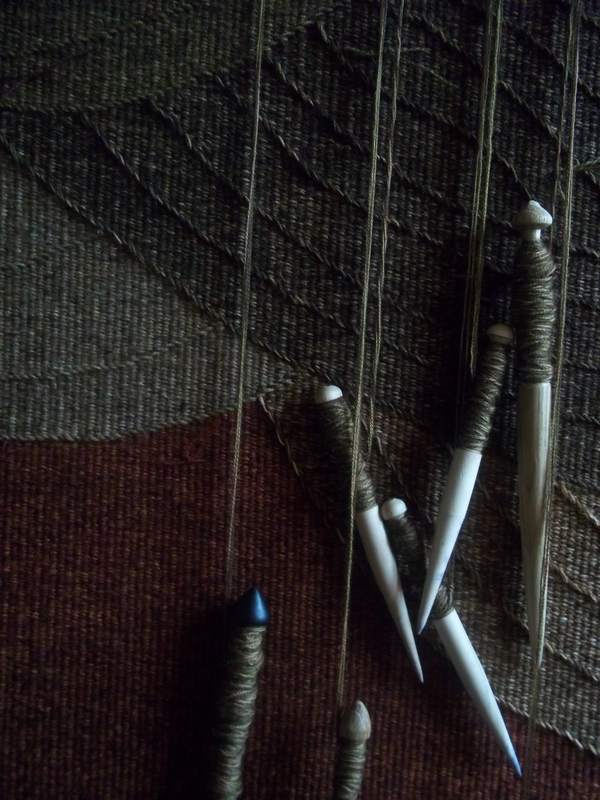 The board sits at one the end of the loom and has really helped me bond with the project as I weave. In my eye line is a reminder of what I am doing and why, and I also end up looking at it whenever I need to check on something technical too. It is no longer just me, the loom, and the task. The bigger picture is there too. This is definitely something I will be doing again in the future. I’ve started calling it my Keyser Soze wall, and if you haven’t watched The Ususal Suspects stop reading this blog right now and do so. Right, that’s enough of a break for me, back upstairs to get on with it. I am working in one of the lighter areas of East Riddlesden Hall but if it is overcast outside it does get quite grim – one day I couldn’t even tell one ball of yarn from the other! Even so, I finally got going on the red skirt and was weaving like a demon, feeling pretty damn smug if truth be told. And then the sun came out – and I could see what I was doing. Gracie’s bottom was full of blotches and streaks. 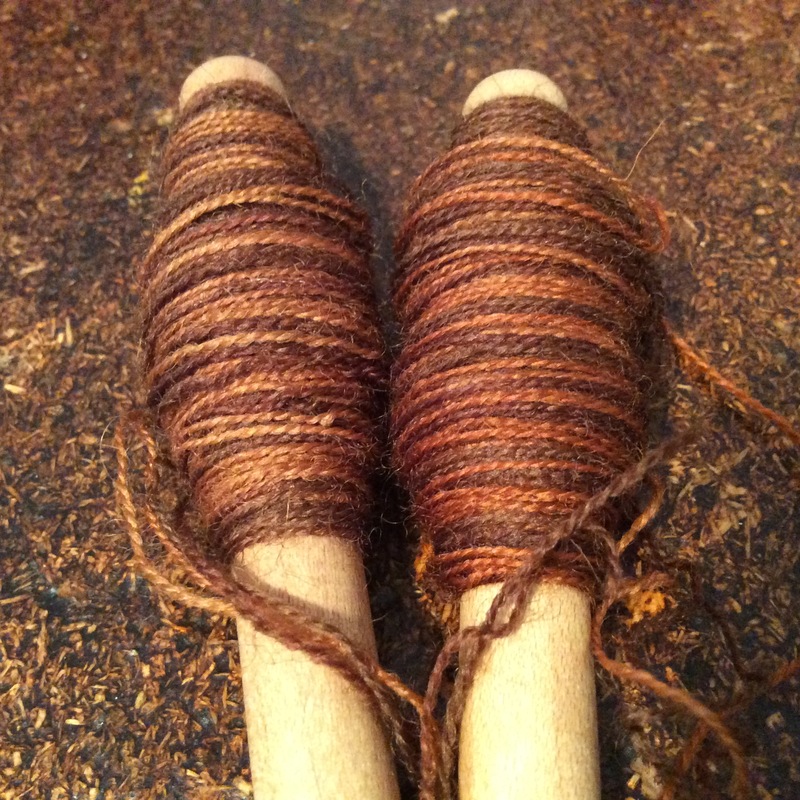 It was clear where one bobbin ended and another began. 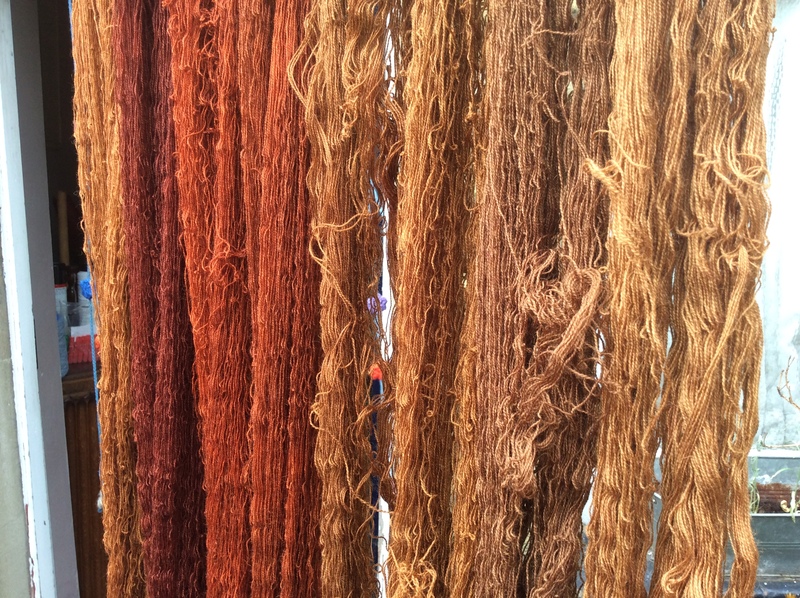 To some extent it is inevitable with the yarns all being hand-dyed – I just wish I had seen it earlier! Slowly on Wednesday I began to accept all that work was going to have to come out. It took a goodly while to cut it all out, being careful not to cut through the warps. But it was the right thing to do. if I am not a perfectionist, I have no right to sit in front of a loom. It took a few days to begin re-weaving it, this time hatching the different bobbins and fortunately the blotches have gone. The red dress is such a huge area of the tapestry it simply had to be right. One wants some variation, that’s the reason for dyeing it the way I do but there is a balance to be struck. 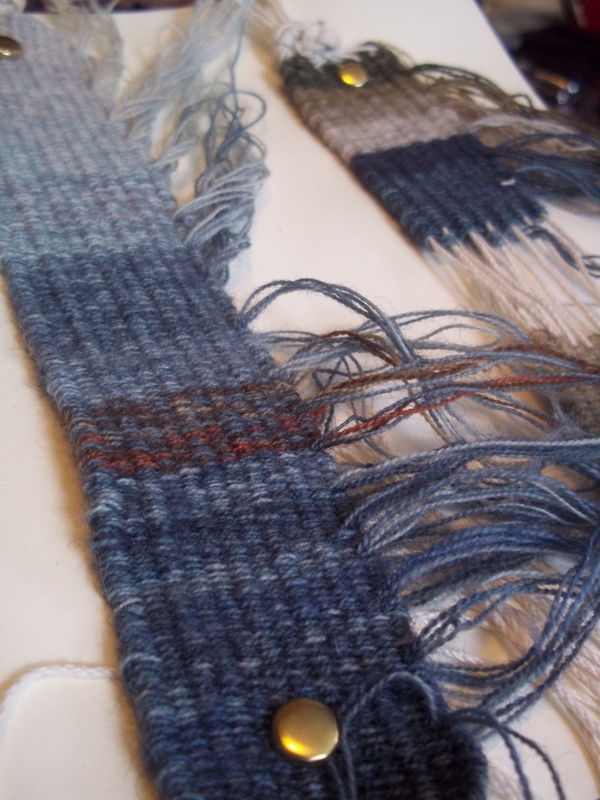 And although hatching is a slower process it is actually making the weaving more enjoyable and interesting. She is really taking shape, she is becoming the tapestry I saw in my head, and that, to be honest, kinda blows my mind. It will be a bit weird weaving her face and having her watch me working on her over the next few months but we are very nearly at that point. We’ve had some really lovely visitors this week and I am getting much more used to being an ‘exhibit’. I’m used to working on my own, and so it has been a real c-change for me, having to have conversations throughout the day. I am also managing without putting my rope up and cutting off the area, in fact I only needed it once, when I had to concentrate cutting out Gracie’s bottom. I am also beginning to accept that however many ‘please don’t touch signs’ I put on her, folk just can’t help themselves having a fondle! I do love her muchly and I am really proud of her. Anyway, I have started a board on Pinterest if anyone is interested.